It's wise to listen to the guide so afterwards you woudn't feel bad about soaken documents or lost camera. 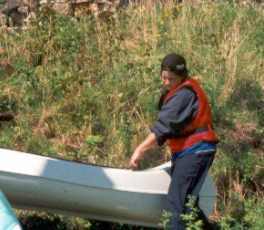 Sometimes you can't get through on a canoe by water. Either the dam is too rocky or there's some other obstacle in the river. Then you'll have to carry your canoe over the obstacle. 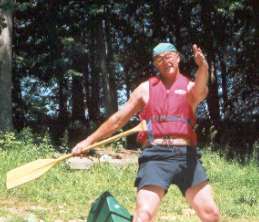 But a true canoeist only enjoys it. Monday - Friday (excl. national holidays) - 20 EUR per person. Group of minimum 6 persons. Saturday - Sunday and national holidays - 25 EUR per person. Children up to 14 yrs (accompanied by an adult) - 15 EUR per person. 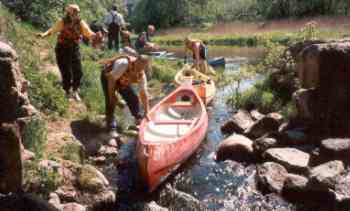 Prices include: a place in the canoe, paddle and PFD, guide's service, instruction and help, local transportation, help and transportation in case of emergency. 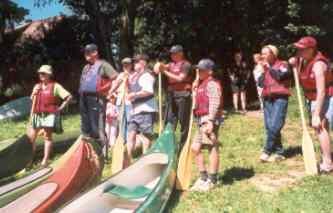 CANOE TRIP WITHOUT GUIDE - 35 EUR per canoe /day (double and triple canoes). for very big groups and other trips please contact us. We also organize multiple days trips. Please contact us for further information. All trips must be reserved in advance!